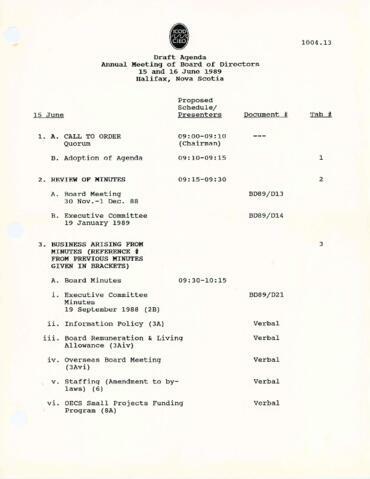 File contains minutes and agenda for ICOD Board of Directors meeting held on June 15- 16, 1989. File includes supporting documentation such as: memos, financial documents, project proposals and summaries, correspondence, reports, background material, and press release. Topics discussed include ICOD Seminar, MarLaw, Marine Edication Kits for St. Kitts/ Nevis, Coral Reef Research, future policy directions, an update on West Africa, report by the audit and evaluation committee, a financial report, project proposals, and a presentation of DELMAR. File contains a duplicate memorandum on budget cuts for 1989/1990, which has not been digitized.